How do I know what fabric to choose? If you have a limited budget, my least expensive (non-clearance) fabric is French twill. I'm able to get it at a good price, and I like to pass that along to my customers. It's the thinnest fabric I have (but still safe! ), so it's cool for hotter climates, although it is fairly tightly-woven, so it won't be as comfortable for long periods with heavier babies. However, for a starter sling, especially if you're not sure you'll want to babywear past a year, I think it's an excellent choice. Right now, I also have stretch twill (cotton with about 3% Lycra for a touch of across-the-width stretch) for $35. This is a great fabric for bigger babies and toddlers; it's a little on the stiffer side, so it's not my top choice for newborns, but it's rugged and long-lasting, and certainly strong enough to carry a toddler. The stretch helps make that "pick me up! no, put me down!" phase easier, too, because you don't have to adjust every time. If these prices are still outside your financial means, I completely understand -- I started making my own slings because I couldn't afford to buy more than one inexpensive one! I have extensive DIY information if you'd like to make your own, and it's easier than you might think. If you can spend a little more, my pricing is competitive enough that it probably doesn't make much of a difference, and you can make your choice based on the other criteria below. Climate. Aside from budget, this is the other major consideration. French twill is relatively lightweight, but the darker colors can be warmer in the sun, as all dark colors will be. It's a fine all-around fabric for any season, if you're staying out of the sun. Linen is my favorite for hot and humid conditions; it's been used for centuries as the go-to fiber for hot places. 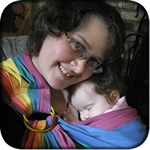 It breathes well and wicks away moisture, helping to keep you and your baby a little cooler, although babywearing at all will tend to warm you up just from the close contact. This doesn't mean linen will make you cold in the winter; the cooling effect comes from the way it wicks moisture, and most of us perspire less in the wintertime, so it's fine as an additional layer in the wintertime. The stretch twills are on the thicker side, and I wouldn't recommend them for heat or humidity. They are best in fall through spring or at higher latitudes. Although it's thicker than any of my other fabrics, the exclusive-to-SBP Tekhni Bios WCRS is surprisingly cool. It's made with Repreve, recycled plastic bottles, and you might think that would make the sling warmer, but it really isn't -- like wool, Repreve breathes very nicely, so the slings are incredibly supportive, but also soft and breathable, and can be used in any climate. For water use (at the beach, splash park, pool, local water hole, and showering! ), the water slings can't be beat! Although I don't recommend one as your only ring sling because the fabric is a little slippery when it's dry, this is a fantastic addition for summertime, and makes showering with your baby much more secure. Some fabrics are inherently more supportive than others because of the way they're woven. Generally speaking, a fabric is most comfortable for babywearing if it has a relatively low thread count (high thread counts are great for sheets, but bad for slings! ), and if the threads are on the thicker side. Purpose-woven wraps, like Tekhni, tend to have thick threads that are more widely-spaced, which gives them an elasticity (though not stretch) that makes them comfortable and supportive. The French twill is wonderful for newborns and smaller babies; it does have a higher thread count than the other fabrics I have on hand, but that's not really a consideration until you get to about 18-20lbs. Linen is more supportive, partially because of the fiber, and works well to at least 28lbs, although you may need to limit carry times if you are just buying a sling at that weight and not using it from birth. The stretch twill is surprisingly supportive (the stretch is really quite minimal), and is my favorite for bigger babies and toddlers. WCRS like Tekhni are fantastic from birth through toddlerhood and even beyond.